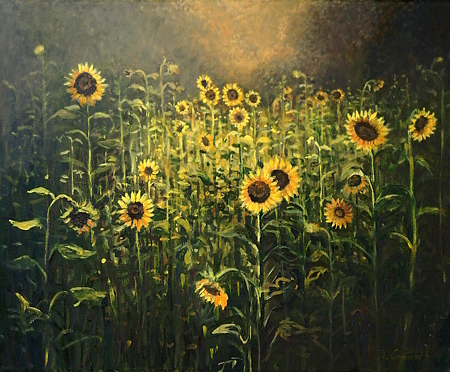 New painting is added to section "Available pictures", canvas named "Looking at The Sun". 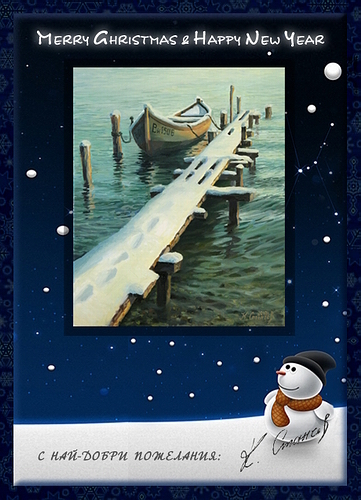 Best wishes to all friends of www.kirilart.com! Wishing you a very sunny weekend! Search for the good, bright things, things that make us smile in life, just like the sunflowers are following the sun whole day long. С пожелание към всички приятели на kirilart.com за един много слънчев уикенд! Търсете доброто, светлото, това което ни кара да се усмихваме в живота, точно както слънчогледите не откъсват поглед от слънцето.С пожелание към всички приятели на kirilart.com за един много слънчев уикенд! Търсете доброто, светлото, това което ни кара да се усмихваме в живота, точно както слънчогледите не откъсват поглед от слънцето. По традиция на първите петима ценители на изкуството, закупили картина през настоящата 2011-та година, kirilart.com ще изпрати подарък - луксозен стенен календар 12 страници + корица, представящ месеците от годината през погледа на художника Кирил Станчев. The first five art collectors who will buy a picture from kirilart.com in 2011 will receive a luxury wall calendar (12 pages + cover) presenting the future 12 months through Kiril Stanchev's eyes. 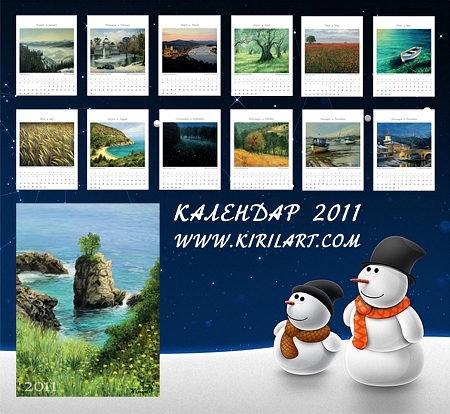 With all the best wishes for the new 2011 to all friends, clients and partners of kirilart.com. Have a very special celebration tonight with your family and a crazy party with friends on the New Year's eve! 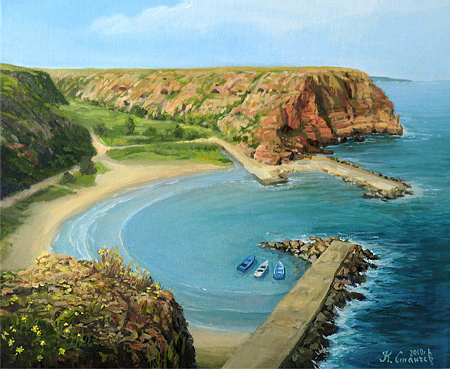 New painting is added to section "Available pictures", canvas named "Low-Tide". One of the remarkable phenomena of nature is the tide on the ocean coast. I was fortunate enough to attend one of the strongest outflows in the history of Southport. 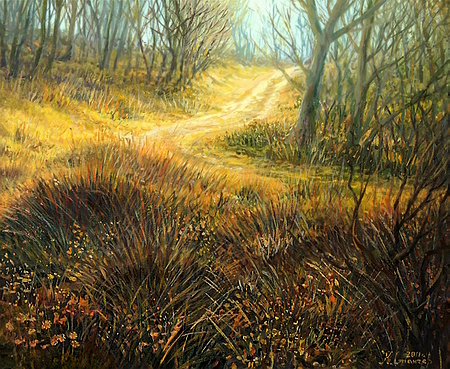 The sun slowly descended toward the horizon, and every detail of the landscape was bathed in warm, soft light. Water had backtracked far away from shore, and the sandy bottom glowed with thousands of small pools of salt water. 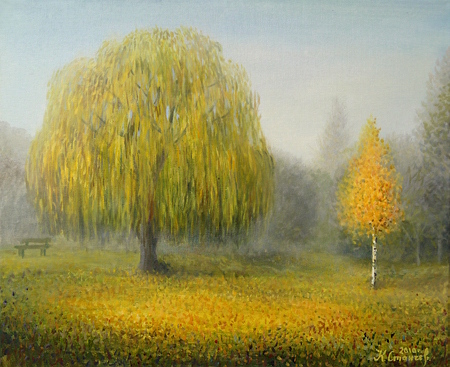 New painting is added to section "Available pictures", canvas named "Autumn in Zlatograd". I remember my first meeting with Zlatograd seemed like yesterday. One of the magical places in Bulgaria that is taking visitor's breath away with authentic Bulgarian culture and the well preserved spirit of the past times. 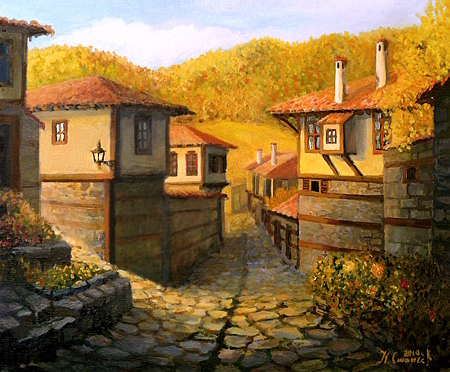 Typical corner windows and chimneys of Zlatograd cannot be mistaken with another place in Bulgaria. I’m look forward to our next meeting with Rhodope Mountain and Zlatograd. 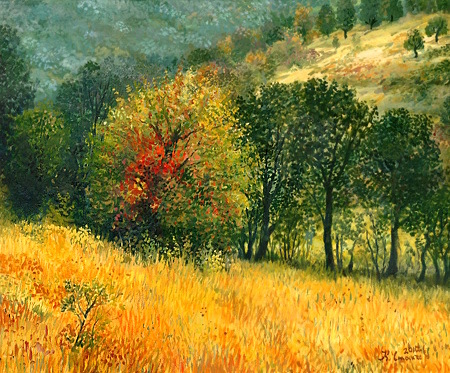 New painting is added to section "Available pictures", canvas named "Sleepy Morning". 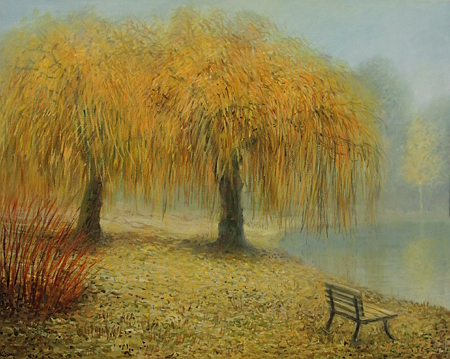 This painting presents an autumn misty morning in a London park. I always find particularly charming the moment early in the morning, when the sun and the fog are fighting for predominance over the landscape.The view changes with each passing second, and it's a real delight for the viewer. 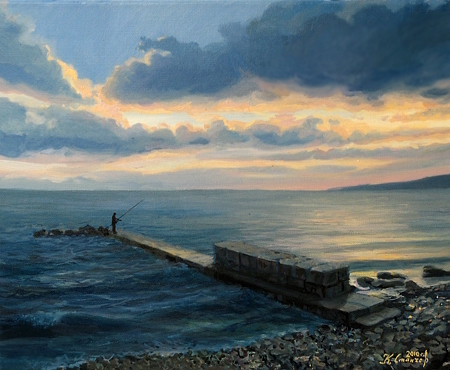 New painting is added to section "Available pictures", canvas named "Sunset in Balchik". Today I'm presenting a canvas, which I've started painting at the age of 35 and signed at 36 :) Years ago, I was wondering, why in the paintings of my grandfather the subject often was Balchik? Now that I live near the seacoast, Balchik is turning into my favorite place for walks along the pier and contemplation of the sea in the warm light of sunset. I dedicate this painting to my grandfather honourable artist Kiril Stanchev, whose name I carry with pride. 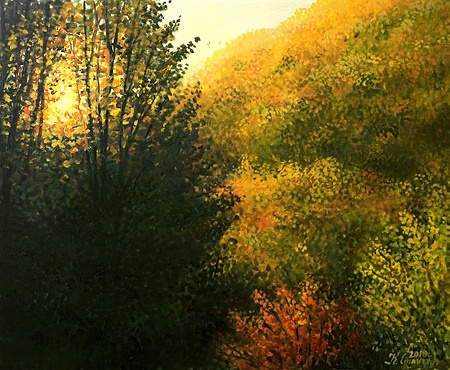 New painting is added to section "Available pictures", canvas named "The Sun Hour". 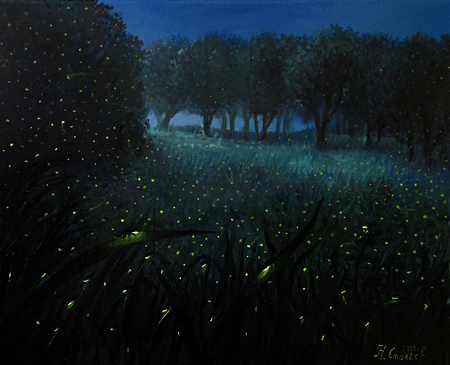 In a series of three paintings, together we will contemplate the coming of a dawn, and to be quite an adventure, I've finally realized a long-standing idea: to paint the fireflies! Expect the meeting with them later in November. The picture I present to you today suggests the idea of oneness with nature, just at that moment the sun smiles over the slope of the mountain and covers everything with warm, soft light. 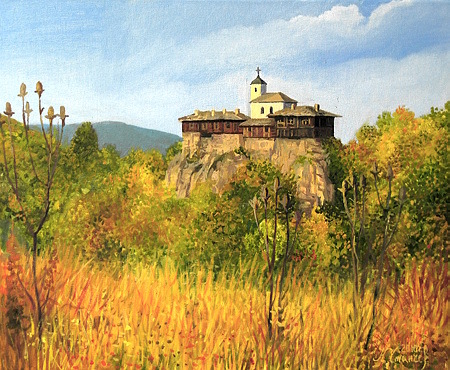 New painting is added to section "Available pictures", canvas named "On the Way To Glozhene Monastery". For me personally Glozhene monastery is one of the most beautiful and charismatic temples of the faith in Bulgaria. Standing on the edge of the cliffs, it reveals to visitors majestic views as far as your sight goes. Every stone, every beam tells snippets of life in the monastery. The small courtyard, nestled between the buildings with naturally cut into the rocks pavement and contrast with stunning views of the surrounding area, creates a fabulous sense of unreality. 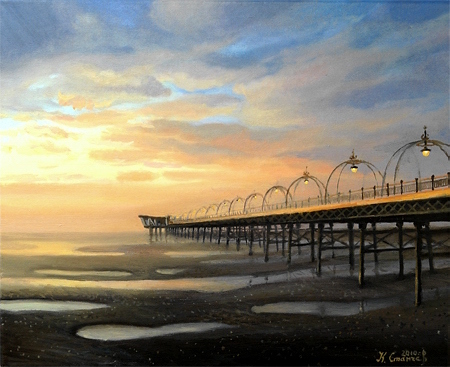 New painting is added to section "Available pictures", canvas named "The Old Pear". As promised, landscapes seen during the summer, one by one will be recreated on the canvas. I'm begining with this painting because it carries in itself sealed some of my happiest, childhood memories. I spent many summers at the foot of the mountain, hiding with other children in the shadow of the old pear. It still stands there spreading its cool shadow on the southern slopes of that hill in Elena Balkan and the wind whispers stories from past years in the branches. 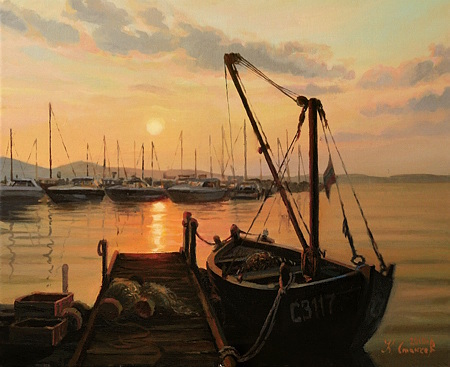 Third painting from the mini-series "Glimpses of The Boats Life" is added to section "Available pictures". 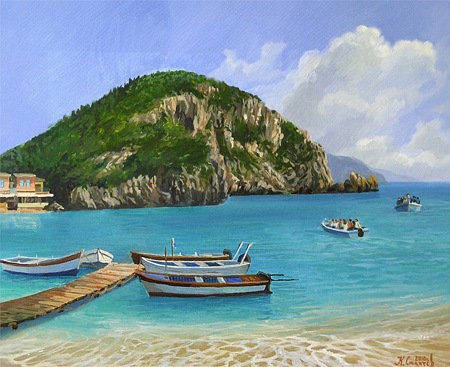 Canvas named "The Boats of Paleokastritsa".